For a number of years I have been studying and learning about evaluation. To be honest, working primarily in the non-profit world and working for social good and social change, evaluation always seemed to me to be the bugaboo that ruined the party. While we’re out there trying to create new things, innovate and respond to novel challenges, build relationships and community, and experiment and fail, evaluation loomed over us like a dark spectre, scolding us for being flakey or demanding that we be more grown up and more responsible. More than that, I had many experiences of evaluation being used as a weapon of power to exert control over the way projects were unfolding. Controlling the money and controlling the standards under which it is spent is hugely powerful. That power can be used badly or by people who don’t want to let go of control over their agendas. And it’s costly and frustrating for people in small organizations to feel like your strategic vision is always subservient to the evaluation framework. So my foray into evaluation began when I started learning about Developmental Evaluation, and from there, learning about all the cool things that evaluators are doing to try to help organizations and communities makes sense of action in complexity. It has led me into powerful learning relationships with colleagues like Trilby Smith from the Vancouver Foundation, with whom I have been learning through a long term Theory of Philanthropy project with that organizations. I’ve connected with Art of Hosting practitioners like Rita Fierro (with whom I’m developing a course) and Nancy Fritsche-Eagan who are really curious about how to do deep participatory facilitation work in the service of good evaluation. And I’ve developed the start of some really beautiful learning relationships with Jara Dean-Coffey who is spearheading the world of Equitable Evaluation and Kim Van der Woerd and Billie Joe Rogers from Reciprocal Consulting who use culturally responsive evaluation to decolonize learning and research. All of this learning and relationship has made me a more conscious facilitator and strategist. It has turned me from someone who is afraid of evaluation to someone who embraces it as a beautiful way to deepen learning, innovation, and strategic work. And it has equipped to confront people who abuse evaluation practice by using it to hide bald faced power grabs and subtle colonization. 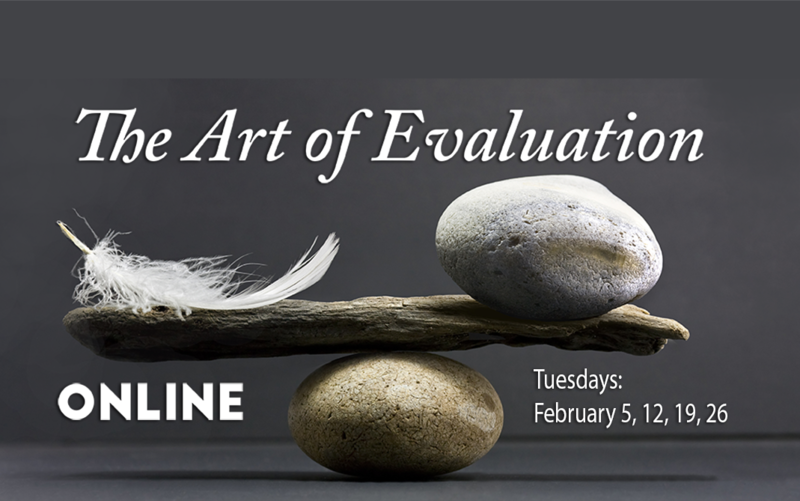 Yesterday I got to play with one of my new learning and working partners, Carolyn Camman and their podcasting pal Brian Hoessler as a guest on their EvalCafe Podcast where we explored the intersection of evaluation, facilitation and complexity. This February Carolyn, Trilby, Rita, and Jara will join me to run an online course exploring these topics with my buddies at Beehive Productions. I invite you to join us there for what will be a really amazing set of conversations intended to open up our practices and apply these tools to complex projects. I’m excited by the fact that I’m doing work in which facilitation and evaluation meet and moosh together. It’s making me better at what I do. Oh we are going to have SO much fun. This is an area where I have experienced the severe undertow of organizational identities organized around the idea that “good” organizations are those that measure things in a neat and orderly fashion. I appreciate the work that you are doing to shift our collective understanding about how to measure change while working in complex systems. It will take many people to break through the mindset that logic models are the one size fit all measurement of change. Here’s to joy in evaluation!